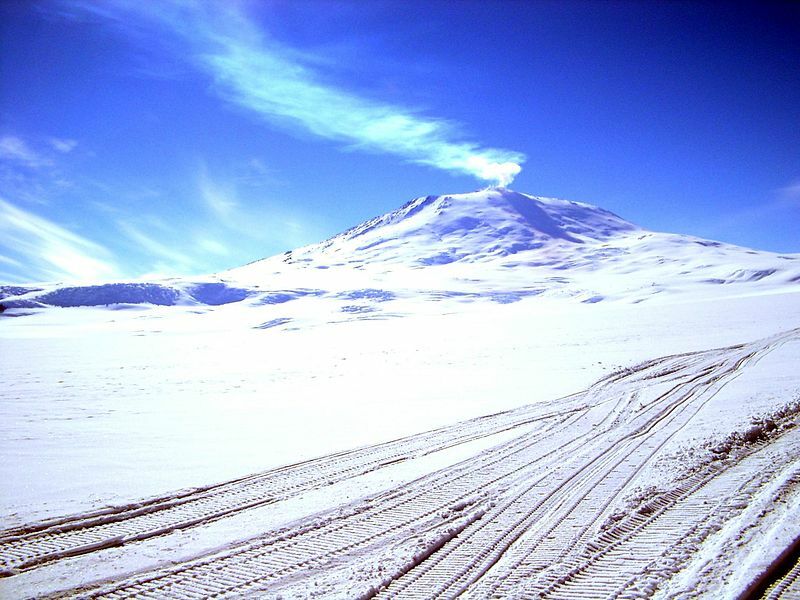 Image of Mt Erebus, Antarctica, showing the distinctive gas and aerosol plume rising off the summit crater. Photo by es0teric (Original on Flickr). Wikimedia commons. Erebus is an enigma. It is the most southerly active volcano in the world, located on Ross island in Antarctica. For at least the past 40 years, there has been a lava lake bubbling in the summit crater, and feeding a continuous plume of gases across the Antarctic continent. Erebus is a stratovolcano, and one of four volcanoes on Ross island; the others being called Mts. Terror, Bird and Terra Nova. Erebus is not associated with a tectonic plate boundary – instead, it is an intra-plate volcano that lies in a rift, where the Earth’s crust has been thinned by slowly being stretched. It is one of several volcanoes in West Antarctica that are likely to be fed from a deep-seated hot upwelling, or plume, inside the Earth. Geologically, the erupted products – alkali rich lavas called phonolites – are similar to those erupted at Mt Kilimanjaro, in Tanzania. How does Erebus stack up as a Top Trumps Volcano? The scores on the cards are based on what we know about the past and continuing activity of Erebus. The historical record of activity is only very short: Erebus was first seen in 1841, and first climbed in 1908. Last known eruption: Erebus has an active lava lake, which has occasional explosions. So it is one of those volcanoes classified as in continuing eruption. Explosivity (Volcanic Explosivity Index) – 2. Pops and bubbles are the order of the day in Erebus’ lava pond. Height – 3794 m. Erebus is one of the tallest ‘free standing’ mountains in the world, and the second highest volcano in Antarctica, after Mount Sibley. Deadliness. 0. No reported deaths, yet. A well known gas geochemist, Werner Giggenbach, burnt some of his socks some years ago when he was caught unware by a small explosion but, outside the times when scientists live and work near the summit during summer field campaigns, Erebus poses little threat to humans. Wow factor – 68. Erebus is spectacular, with wonderful views into the active crater and beyond, but it has to be one of the most remote monitored volcanoes in the world. Unpredictability – 7. The pattern of known activity at Erebus is spectacular, but monotonous – with an occasional, but long-lived, lava lake and spectacular bubble bursts deep within the current crater. Devastation Potential – 231. Erebus is a large volcano, quite close to McMurdo sound, and one of the largest scientific research stations in Antarctica. Although it has only ever been seen to have minor eruptions, it has certainly had larger eruptions in the past. There are some very useful pages on Erebus hosted by VolcanoDiscovery.com, and a nice description of field work, and the current activity at Erebus, along with some field photographs. The volcanofiles maintain a set of pages which describe their ongoing work on Erebus.